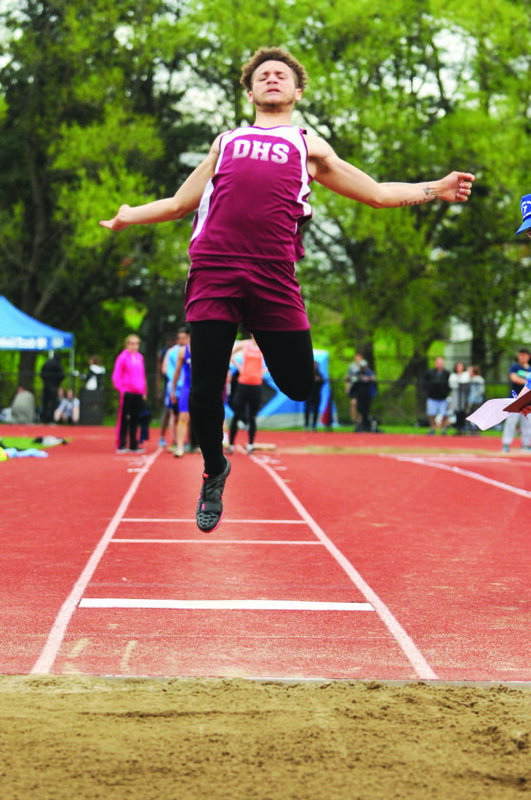 OBSERVER Photos by Roger Coda: Dunkirk’s Issiah Velez is seen competing in the long jump. Though Velez had an impressive jump of 18-feet-9-inches, he was chosen as the track Most Valuable Player. The Dunkirk Marauders boys track and field team put together a phenomenal effort in taking third place at their own track and field invitational Friday. Issiah Velez was named the track Most Valuable Player. Meanwhile, Cattaraugus-Little Valley’s Kellen Martin won the overall MVP with Hamburg’s Alex Andrzejewski winning the field MVP. 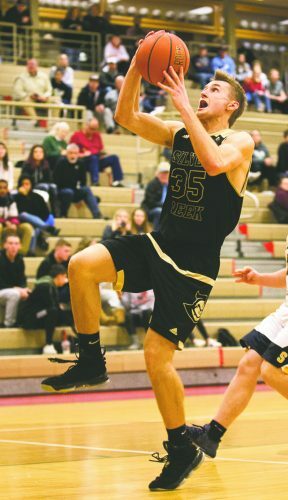 “I know (Issiah) is one of the top athletes in the county and he showed it,” Dunkirk coach Adam Wolfe said. 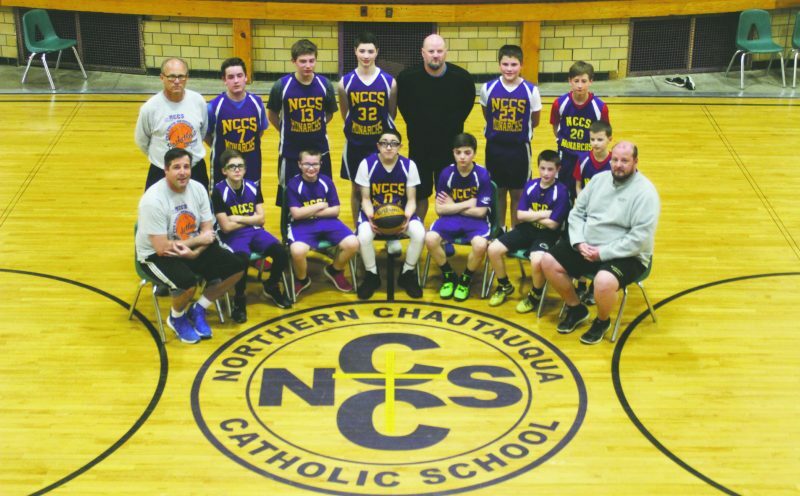 Hamburg took first place with 93.5 points followed by Orchard Park 84, Dunkirk 75, St. Francis 69, Clymer/Sherman/Panama 55, Cattaraugus-Little Valley 44, Iroquois was seventh at 39, Pembroke was eighth at 38 and East Aurora was ninth at 37. Tenth place went to Jamestown with 36.5, followed by Springville 36, Fredonia 25, Attica 25, Sweet Home 23, Silver Creek 10 and Gowanda 16th at six points. For the girls, Silver Creek’s Emma Seiders won the track MVP, Iroquois’ Rachel Donner was the field MVP and Jenna Crean, of Orchard Park, was the overall MVP. Orchard Park placed first with 93.5 points followed by Iroquois 69, Fredonia 61, East Aurora 60.5, Clymer/Sherman/Panama 58.5, Silver Creek 51, Dunkirk 50.5, Sweet Home 49, Pembroke 48.5 and Attica was 10th at 35. Cattaraugus-Little Valley was 11th at 33 followed by Jamestown 32, Hamburg 30, Springville 27, Gowanda 2 and Westfield was 16th at 1.5. Fredonia’s Emily Brown took second in the girls 2000-meter steeplechase event with a time of 7:41.35. For the boys 4×800 relay, Dunkirk’s Christopher Michalski, Anthony Ruiz, Mike DeLand and Nelson Estrada-Cruz finished in second at a time of 8:19.08. Lydia Lanski, of Fredonia, won the girls 100 hurdles at a time of :16.82. Fredonia’s Laural Erick and Silver Creek’s Emma Seiders placed second and third, respectively, in the girls 100 dash with times of :12.97 and :13.03. In the boys 100 dash, Dunkirk’s Issiah Velez won with a time of :11.73. Joell Colon, of Fredonia, took fifth at :12.18. In the girls 1,500 run, Emily Brown, of Fredonia, placed third with a time of 5:09.84. In the boys 1,600 run, Diego Rey, of Fredonia, placed third with a time of 4:42.89 and 4:44.86. Dunkirk’s Paola Rodriguez, Jessica Beehler, Jericha Petrella and Emilee Hanlon earned the second-place spot in the girls 4×100 relay with a time of :52.44. In the boys 4×100 relay, Dunkirk’s Jonah Rosas, Sabien Smith, Nelson Rosario and Velez placed second with a time of :45.93. Fredonia placed third with the team of Dyress Batten, Andrew Field, Nate Shuart and Colon, who paced a time of :46.94. Seiders took second place for Silver Creek in the girls 400 dash with a time of :58.3. Dunkirk’s Petrella placed fifth with a time of 1:01.24. In the boys 400 dash, Dunkirk’s Mike DeLand and Michalski placed fourth and fifth, respectively, with times of :52.94 and :53.11. In the girls 400 hurdles, Krystel Schwab of Silver Creek placed second with a time of 1:10.59 and Fredonia’s Lydia Lanski in third with a time of 1:10.74. In the boys 400 hurdles, Macadam Gadewoltz took fourth for Silver Creek with a time of 1:02.08. In the girls 800 run, Silver Creek’s Jaylah Cossin placed third with a time of 2:21.5. For the boys 800 run, Dunkirk’s Estrada-Cruz placed third at 2:02.49. In the girls 200 dash, Seiders took the top spot with a time of :26.25 as Dunkirk’s Hanlon at :26.49. Erick was fourth at :26.98.In the boys 200 dash, Billy Seiders of Silver Creek placed fourth with a time of :24.59. For the boys 3,200 run, Dunkirk’s Anthony Ruiz placed third with a time of 10:19.17. In the girls 4×400 relay, Silver Creek’s Kylie Procknal, Krystel Schwab, Cossin and Seiders won the top spot with a time of 4:09.52. Dunkirk placed in second at a time of 4:17.01, who consisted of Hanlon, Faith Rivera, Kate Michalski and Petrella. For the boys 4×400 relay, Dunkirk’s Estrada-Cruz, Smith, DeLand and Christopher Michalski placed third at a pace of 3:37.18. In the girls high jump, Dunkirk’s Hanlon won with a jump of 5-feet-1-inch. Fredonia’s Claire Stokes was in third at 5-0. Hanlon’s teammate, Rivera, placed fifth with a 4-8. In girls pole vault, Kate Michalski, Dunkirk, was in third with a height of 8-6. For the boys pole vault, Dunkirk’s Smith was in second with a jump of 10-6. In the boys long jump, Velez leaped 18-9, which was good enough for third place. In the girls triple jump, Ashley Beckwith won with a distance of 33-6.5. In the boys triple jump, Dunkirk’s Velez placed fourth with a distance of 37-04.5 and Gowanda’s Ethan Francis went 37-03.75.